Dragana Sotirovski is a correspondent for the Serbian public broadcaster RTS, as well as editor-in-chief of the RTS branch offices centre in Niš. 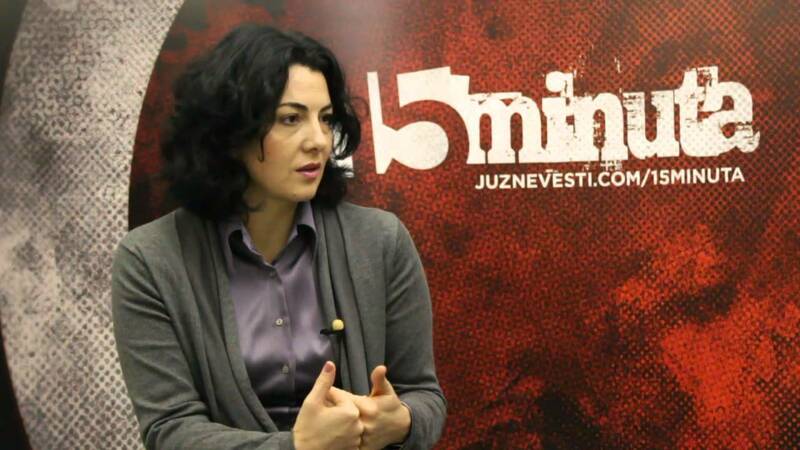 She has worked as a journalist for Radio Novosti, the RTS 3 channel and the RTS Informative programme in Belgrade. Sotirovski is the author of many investigative articles, documentary films and travel shows made both locally and abroad. She has received multiple journalistic awards and accolades. Ms Sotirovski, how much did the threats you received for carrying out your journalistic profession affect your life? The only thing that has changed is that I’ve become more persistent about the researches I’m doing. In November last year, after a cover story about the Niš Special hospital on the public broadcaster RTS, the director of the hospital called me and offended me repeatedly. She told me I would “remember her”. She was displeased by the facts and by parts of the statement she gave me. What you did after this call? When the hospital director called me, I contacted the police and filed a complaint for the threats I received. The police forwarded the case to the Prosecutor’s office in Niš. For unknown reasons, the case went missing, but later appeared at the Public Court in Aleksinac. The prosecutor rejected my case as being unfounded, which I filed a complaint against, and the initial decision was confirmed by the Higher Public Court in Niš. After that, I had no right for another complaint. I continued my research while the management of the hospital continued with threats and pressures. I was then contacted by many hospital employees who had previously helped me with my research. They asked me to stop my investigation and not to publish any more information. They justified this sudden change with personal interests. Some were promised jobs for their children, others were afraid for their own employment and for the potential consequences. I continued publishing the irregularities I found, and they continued their denials, calling for my expulsion from the correspondent’s office, so that I would be prevented from coming to Sokobanja, where the hospital is, to continue my research. The director and three out of the existing seven syndicates called for the discontinuation of my investigation. Do you have any advice for journalists who might experience verbal threats or physical attacks? What should they do in such a situation? They should immediately contact the police and the journalistic associations, raising their case to a certain level so that the authorities can finally help all of us in the journalistic profession, protect us, allow us to work professionally and without pressures. What advice would you give to your colleagues about how to protect themselves from verbal threats and other forms of attack? Real protection is virtually non-existent, but it is relevant that they do their job professionally, have data to back up everything they’ve stated, prove to their editorial staff that they are doing the right thing, to fight against self-censorship and persist in their research. It is also important for journalists to display solidarity among themselves, so that they can promote the idea to authorities, state institutions and the general public, that when an issue arises in the society, it has to be dealt with. I believe that media workers and the authorities have the same mission. If you have a Prime Minister who stands out against crime and corruption, and you have media workers who investigate crime or corruption and publish it at the risk of their own lives and the lives of their families, then state institutions should look into these matters and resolve them quickly. In the case of the Niš Special hospital, for example, my research was published and sent to the anti-corruption agency. The hospital employees sent denials of all the information to the same agency, but in spite of this the agency issued a recommendation that the director should be removed from her position. So in my case, after I reported, the public reacted, the anti-corruption agency reacted as a state institution, but the Ministry of Health stayed quiet. Is it harder to be a local journalist than to work in the capital? What additional safety concerns affect local journalists? It is harder on the local level, but you must stay a professional. Sometimes the risk you invest pays off. Serious media companies respect persistent, brave journalists. Journalists that receive some type of bribe do exist. They are on the payrolls of certain individuals and institutions, so it’s impossible for them to report about any subject without being biased. Some journalists, on the other side, often don’t write about problems that exist in their society simply because they do not want to see the problems. Journalists who work in the capital are usually divided by the topics they cover, and there are many examples of journalists making a transition from their profession into PR jobs, working for the government, the institutions or the establishment. Local journalists, on the other side, have to cover many different topics and don’t have a specific area of reporting, therefore they have to follow many interests. They have to research, put the puzzle together and finally get results.